The Char Dham All Weather Road Project has been approved by National Green Tribunal (NGT) on September 26, 2018. The controversial project has evoked several environmental concerns right from the inception stage. Almost more than one and half year into the unmindful implementation of the project, the risks and fears associated with the project are clearly visible throughout the construction route. In last few months, several independent reports have also raised serious concerns over the haphazard manner in which the project is being executed through sensitive hilly terrain. 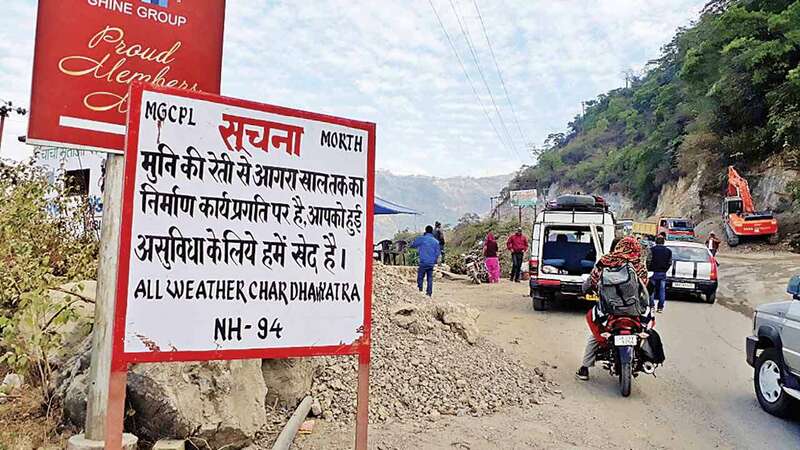 Char Dham All Weather Road Project is a two-lane expressway project currently being executed in Himalayan state Uttarakhand. The project proposes widening of single lane roads into double lane by upto 10 meters. The stated aim of the project is to improve the accessibility to Char Dham (shrines) namely Yamunotri, Gangotri, Badrinath and Kedar Nath. The project also proposes creation of 889 km long national highways to connect whole of Uttarakhand state. It has been divided into 7 packages comprising of 9 destinations including Tanakpur to Pithoragarh stretch. The project is named Char Dham Mahamarg Vikas Pariyojana (Char Dham Highway Development Project). After completion it would be known as Char Dham Mahamarg (Char Dham Highway). The total cost is ₹11,700 crores. The foundation stone of the project was laid by PM Narendra Modi on 27 December 2016. The project includes construction of two tunnels, 15 big flyovers, 101 small bridges, 3596 culverts and 12 bypass roads. About Rs. 3000 crore has been sanctioned for the project and tenders have been awarded for the same. The project is touted as a tribute to the victims of the 2013 Uttarakhand floods. It is presented as a booster to State economy by facilitating religious and recreational tourism. Connectivity to the India-China border is stated as another big reason for high level push behind the project. The first major impact of the project is happening on trees and resultantly on dwindling forest cover of the state. Various reports claim that from about 33,000 to 43,000 trees would be cut across 8 districts to make way for the roads. Various reports even states that about 25,303 trees have already been cut on a combined stretch of 356 km of forest land. In all 508.66 ha forest land would be diverted for the project of which the environment ministry has reportedly given approval for diversion of 475.71 ha forest land. Notably in the last 2 years, Uttarakhand have not reported even 1 percent increase in its forest cover. The latest Forest Survey of India (FSI) 2017 report finds only a marginal increase of 23 sq km forest cover since 2015. On the contrary the 2015 FSI report mentions of a decrease of 268 sq km in the forest cover since 2013. The report cites rotational felling and diversion of forest land for development activities as main reason behind fall in forest cover. Out of 53,483 sq km geographical area about 24,240 sq km area is under forest cover in the state. A 94 km long stretch of the road project falls in Bhagirathi valley, Uttrakashi which is a part of the eco sensitive zone (ESZ) notified on December 18, 2012. The ESZ covers 4179 sq km area along a 100-km stretch of Bhagirathi river from Gaumukh to Uttarkashi. Construction activities are prohibited in ESZ. To escape the mandatory environmental clearance the centre government has divided the 889 km long project into 52 parts. This means that the project has gone through no environment, social or disaster potential assessments, no public consultations, no appraisal, no monitoring, has no management plans and no question of any compliance. For widening of the roads precarious mountain slopes are being cut in a haphazard manner with the use of heavy machines like JCBs and Poklands. The process has removed the vegetation cover on slopes downhill and exposed underneath soil and rocks to erosion along the slopes. There have been many reports showing how hasty widening of roads has destabilised the slopes and ensued multiple landslides. There are 29 landslide-prone zones identified along Char Dham project route. Report says that owing to inappropriate road cutting over 500 landslides have formed across project routes. As per experts mountain’s slopes should not be cut at 80 degree or 90 degree angle but in a hurry to meet deadline the proponent are ignoring all such precautions. There are places in Uttarakhand where landslides have become permanent disaster. The recurring landslides at Varunavat Parvat and at Ojhari both in Uttarkashi are evidence of region’s fragility. Recently a study has found that soil erosion and landslides is contributing substantially to soil loss resulting in the decline of productivity of agricultural land. The scientists also warn that the state is located in one of the most hazard-prone belts in the Asia and is susceptible to earthquakes, landslides and floods. As per the study, weak geological formation, active seismicity and deforestation are main causes of soil erosion in the state, the Char Dham project is increasing the hazard potential, that too without even making impact assessments. The debris, rubble and muck generated in massive amount from slope cutting is being dumped directly in the rivers. This has disturbed aquatic life and water quality of the stream, ALL in Ganga basin. The Government has made some dumping zones but most of them are also located close to rivers. The government is thus adversely affecting its own Ganga rejuvenation objective and not even assessing how the project would affect its Ganga rejuvenation objective. As per reports, at Rudrapur-Gaurikund stretch of the project in Kedarghati, muck was being dumped directly in the Mandakani river obstructing the free flow of the river. Same was happening on project routes along Alaknanda River. The dust clouds formed by the work have been enveloping the hilly region. This is having adverse impact on the growth of flora and health and life of native people. There are reports revealing that at many places dumping of muck has been damaging the farm land thus affecting the livelihood of people. Many of the affected people have been protesting against indiscriminate muck dumping. Villagers living along the Char Dham route between Rishikesh and Chamba talk of having lost all their crop fields and grazing lands due to project work. They also reported of the deaths of children buried under landslides Watch video. On July 20, this year, there was a tragic accident, in which14 persons were killed and 17 others injured when the bus they were travelling in fell into a 300-metre-deep gorge near Kirgani, on the Rishikesh-Gangotri highway, in Tehri district. Reports suggest the bus driver, who was injured too, lost control over the vehicle after failing to navigate a crater and debris present on the road where the work for the all-weather ‘Char Dham’ road is on. The site also falls in the landslide zone. People of Uttarakhand are paying a heavy price for the project. Adding a new dimension in the issue Ratan Aswal, social activist from Garhwal claims that a large amount of muck generated by cutting hills have been dumped in the lush green forest on the river banks, thus leading to natural water sources drying up. Is It A Disaster In Making? Environmentalists have been raising concerns over the projects since the beginning. Here is an eye opening video on the Char Dham Road and how it will be permanent disaster for the state, as narrated here. In another painful video showing the way between Rishikesh and Chamba highlights how the highway project has already become a disaster for local community, who have not been compensated or rehabilitated. As per reports, the project is happening, in complete violation of all environmental safeguards. Activists allege that the project is pursued in haste and would result in an irreparable loss. They point out that nature is already giving warning signs with new active landslide zones being formed. According to experts, unchecked construction of highway may end up triggering disasters in the ecologically sensitive Uttarakhand region. Renowned geologist K S Valdia has also warned that the ambitious project could turn into a major faux paus for the government. He points out that it has been planned out at the regulatory floodway of the Ganga basin. A regulatory floodway is the river channel and adjacent flood plains that must be kept free of encroachment so that the flood discharge can be conveyed without increasing the base flood elevation more than a specified amount. A construction close to the floodway could be an alarming situation as the region is prone to floods and landslides. Indeed, the project is being carried out in an unsustainable manner even when numerous reports after the 2013 disaster have warned against such projects. For instance, a report by the National Institute of Disaster Management called for avoiding “blasting for developmental activities as it destabilizes the weak rocks in mountainous regions”. Reports have suggested that PM Modi may launch his campaign for the 2019 general elections from Kedarnath, the ancient shrine that is significant for many Hindus. He had also announced, March 2019 as completion deadline for the project. To ensure speedy implementation, it is being monitored at the level of the PMO. It seems that the government is pushing the project for electoral gains at the cost of local people and Himalayan ecology. When it was realized that the work was not going fast enough, the chief secretary overseeing the road and reconstruction projects in Kedarnath was transferred after the PM’s October 2017 visit. The new officer is believed to have been handpicked by the PM, it is reported. Union Minister for Road and Transportation Nitin Gadkari had set a more ambitious timeline, targeting completion of project by the end of 2018 and even urged the MoEF to expedite the necessary clearances. But according to a government March 2017 press release, the project has been delayed for reasons unknown and it is now likely to be completed by March 2020. 1 28 Feb. 2018 NGT issued a notice to the union transport and environment ministries as well as the Uttarakhand government to furnish their replies before the tribunal by March 12. 3 4 May 2017 NGT sought responses from the Ministry of Environment and Forests (MoEF), Ministry of Road Transport, National Highways and Infrastructure Development Corporation Limited (NHIDCL), Border Roads Organisation (BRO) and Uttarakhand government by May 31 on the debris being dumped on mountain slopes. 4 23 May 2018 A bench headed by Acting Chairperson Justice Jawad Rahim asked the ministry to file an affidavit by May 28 giving details of the ongoing work and inform it about the areas where the work has not commenced yet. 5 11 June 2018 The Uttarakhand High Court ordered that all construction activities along river banks, including construction of hydroelectric power projects, and road construction projects in the state, be stayed till suitable muck disposal sites, for discarding the muck generated during the construction activities are identified and are made operational. 6 10 July 2018 Hearing a petition filed by NGO Common Cause, NGT issued notice to the Central and Uttarakhand governments, asking them what actions they have taken for the disposal of muck generated during construction of roads under Chardham Project in the hill state. 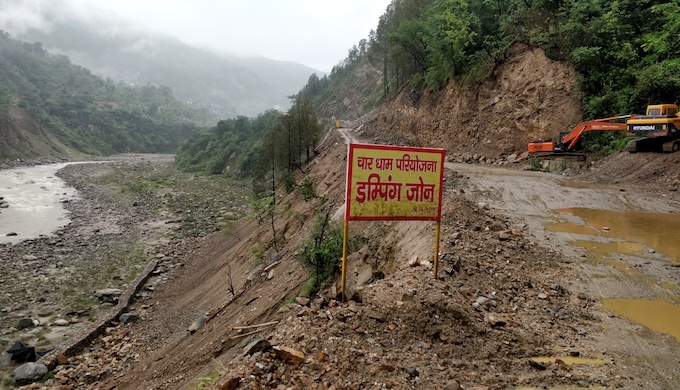 Appearing for the NGO, advocate Gaurav Kumar Bansal argued that during the construction of Chardham roads, muck is being dumped “in an unscientific and irrational manner” and is causing damage to the ecology and environment. 8 27 Aug. 2018 Supreme Court ruled against a fresh hearing in the Char Dham Highway case by the NGT and ordered that the original bench, which had heard the case over several days, hear the matter over a day and “finally dispose of it”. An NGT bench headed by Justice Jawad Rahim had heard the matter over 14 hearings in which the petitioners had argued against the highway project, pointing out that necessary environmental clearances had not been obtained. On May 31 this year, the bench heard closing arguments by both parties and reserved its judgement. In June, Justice Adarsh Kumar Goel took over as chairperson of the NGT and, while the judgement was due, decided to hear the matter afresh. The petitioners approached the Supreme Court against the NGT’s decision for a fresh hearing in the matter arguing that jurisdictional errors had been committed. The SC accepted the arguments made by the lawyers on behalf of the petitioners and ruled that the original bench of the NGT should hear the matter over “one clear day” and “finally dispose off the matters before it”. 9 28 August 2018 A bench headed by NGT Chairperson Justice Adarsh Kumar Goel posted the matter for hearing at 2 pm on Sept. 4 after taking note of the Supreme Court order which had asked him to grant at least one clear day to finally dispose off the matters. The matter will be heard by a bench of Justices Jawad Rahim and S P Wangdi and expert member Nagin Nanda. The apex court had on Aug. 27 acceded to the request of advocate Sanjay Parikh that the matter be heard by a three-­member bench as they had reserved the judgment on May 31. The petitioner NGO had said that the environment clearance was must for the project and the ongoing work was “blatantly illegal”. It had said the trees and mountains are also of national importance and it is the government’s duty to protect and preserve them. The Environment Ministry had earlier informed the NGT that it has received no proposal for environmental clearance of the project and hence the question of an EIA study of such a project does not arise. The ministry also said that under the 2006 EIA notification, only new national highways and expansion of highways over 100 kms need to get prior environmental clearance. The petition of the NGO also contended that the Centre has allegedly deliberately broken it into small stretches to do away the requirement for obtaining environment clearance. 10 4 Sept. 2018 The bench of justices Jawad Rahim and S P Wangdi and expert member Nagin Nanda said that as the Supreme Court has noted in its order that the matter is complex one, it should be heard by a larger bench. The green panel said that the bench would be decided by the NGT Chairperson Justice Adarsh Kumar Goel and posted the matter for hearing on September 6. Advocate Sanjay Parikh, appearing for petitioner NGO ‘Citizens for Green Doon’, said that under “no circumstance” the matter can go to a different bench if the judgement has been reserved in the matter. He said that as per the apex court order, the case should be heard by the same bench which was hearing it earlier. The NGO had approached the top court when a bench headed by new NGT chairperson Justice Adarsh Kumar Goel recently said that it will rehear the matter in entirety. 11 19 Sept. 2018 The Uttarakhand government and BRO assured a bench headed by NGT Chairperson Justice Goel that they would carry out the project after due compliance with the laws, especially the Bhagirathi ESZ notification of December 18, 2012. They also told the green panel that during the project’s implementation, they would ensure that no muck is thrown either into the river or in the forest areas down the hill. The four pilgrimage towns to be connected by the 900 km-long highway are Kedarnath, Badrinath, Yamunotri and Gangotri. 12 26 Sept. 2018 A four member NGT bench, headed by NGT Chairperson Justice AK Goel, cleared the project while constituting an expert committee to oversee the environmental concerns related to the project. The 7 member committee will be headed by a special secretary of the union environment ministry and has been entrusted with the job to oversee it through the execution to completion. It will comprise representatives from Wadia Institute of Geology, Govind Ballabh Pant National Institute of Himalayan Environment and Sustainable Development, National Institute of Disaster Management, Central Soil Conservation Board, Forest Research Institute and Uttarakhand forest officials. “The above committee will get liberty to take technical inputs wherever necessary. Committee can also consider suggestions or concerns of public and will have their own website to receive and disseminate information. The committee has to be constituted in two weeks by Ministry of Environment and Forest,” the bench stated. In its order, the bench stated that the issue for consideration before them was if there was violation or damage by the project and what safeguards are required. “Protection of environment is of primary concern under the precautionary principle and sustainable development…these are accepted principles of environment jurisprudence…no project can be carried out that endangers human health or public safety,” the bench stated. 13 26 Sept. 2018 The green panel said it was inclined to clear the project with requisite safeguards in view of the larger public interest and the country’s security in the construction of highway. The bench headed by Justice Goel, also comprising Justices Jawad Rahim and S P Wangdi, made it clear in its order on Sept 26, 2018 that statutory environmental impact assessment under the Environment Protection Act, 1986 was not required in view of exemption granted through notification dated August 22, 2013. The tribunal noted that structural stability of muck-dumping sites was not satisfactory and there was possibility of some caving in during excessive landslides and other natural disasters. “Therefore, stabilizing such sites with Gabion wall/crate wires at places where load is less seems to be adequate but in high load bearing sites, augmented RCC structures followed by strengthening by way of grids through engineering and bio-engineering methods would stabilize such sites. “State government to also notify Debris Dumping Policy which includes details of environmental restoration and restitution. The Committee shall also look into disaster management and disaster preparedness measures,” the bench said. There are number of advantages of this highway project in Uttarakhand hills, apart from adverse effects that you have explained above. One unseen moto of govt could be provide wide access for army to Chamoli border as we have long border line there with China. There could be endless talk on pros & cons, but the way this project going is far much speeder than other projects of the country. The authorities like NGT, Court have to get to the ground and sort the matter as soon as possible. Thanks, but this misses the key issue. The project has been pushed by manipulating so that no impact assessment is done. This is clearly wrong.